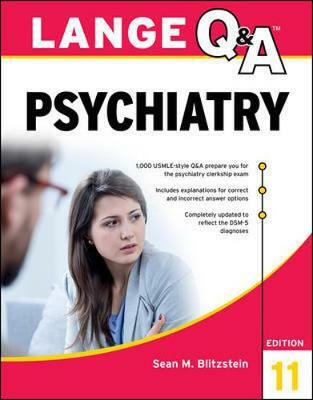 The most thorough psychiatry review available for the USMLE Step 2 CK and psychiatry clerkship exam - completely updated to reflect the DSM-5 Covering all of the clerkship's core competencies, LANGE Q&A Psychiatry delivers more than 800 exam-style questions and answers with concise but comprehensive explanations of correct and incorrect answer options. The Eleventh Edition of this this trusted review simulates the USMLE Step 2 CK test-taking experience by delivering multiple-step clinical vignette questions and updates on the latest therapies for psychiatric diseases and disorders. Questions are carefully selected to match the style and difficulty level of what students will face on the test.